A four-engine Douglas R5D-2 transport, Bureau # 39116 and assigned to Marine Transport Squadron 152, departed El Toro Marine Air Corps Station in Orange County at 10:30 in the morning on a flight to the Alameda Naval Air Station. Aboard were 34 United States Marines from Camp Pendleton en route to Hawaii for overseas assignment, one additional Marine deadheading to San Francisco to visit his parents, and the plane's flight crew of five. After a relatively routine flight, at 1:42 in the afternoon, and after circling for 30 minutes, the aircraft’s pilot, Major Alexander Watson, contacted the control tower at Oakland Municipal Airport, reporting that he was on his approach to Alameda NAS. Along with his co-pilot, First Lieutenant Thomas E. Straughan; navigator Master Sergeant Donald J. Down; flight engineer Terrell M. Young; and radioman Staff Sergeant Harry E. Knight, the plane was to begin its descent into Alameda. But instead, the plane, while flying in low overcast and drizzling rain, flew up a steep canyon, skimmed over one ridge and then slammed into Sunol Ridge on the ranch of Elmer O’Connell, about three and a half miles north of Niles. 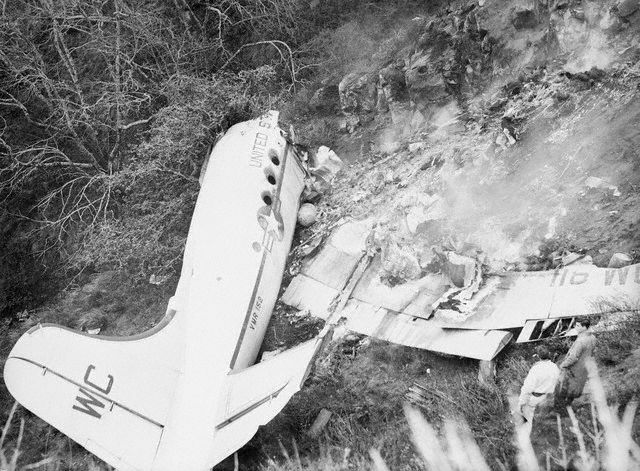 The aircraft broke up and burned, killing all 40 on board and scattering wreckage and bodies over a 300-yard area on the canyon walls. Russ Reed, a photographer for the Oakland Tribune, was first to discover the blazing Marine plane wreckage in Niles Canyon when he and his pilot, Warren Bogges, flew over the crash site a short time after the impact. 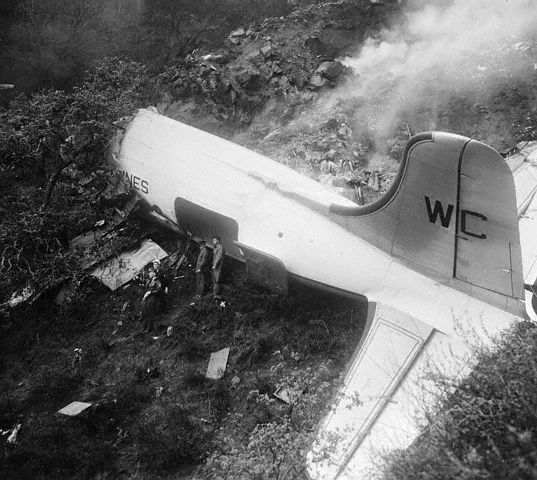 It took rescuers over an hour to reach the crash site, located at the 1,300-foot level, due to the treacherous terrain, and upon their arrival, viewed a terrible scene - an area littered with bits of bent aluminum, burned barracks bags, smashed instruments, and a torn parachute. Also, identifying those aboard the ill-fated flight was initially hampered when a passenger manifest from a similar yet separate El Toro departure was mistakenly issued, then quickly retracted after several Marines came forward as alive when they had been reported as deceased to their families. Major Robert Meeker, public relations officer at the El Toro Marine Air Station, said the wrong passenger list got aboard the plane which crashed. This caused the issuance of an erroneous fatality list and the subsequent notification of next of kin. "Nobody knows how it happened yet. But somehow the passenger list for Plane 3 got aboard Plane 4, and vice versa." One last addition to the death toll was that of a Bay Area Marine, Staff Sgt. Donald J. Fraser, who "hitchhiked" a ride on the ill-fated craft to have a belated birthday celebration with his parents, Mr. and Mrs. Henry J. Fraser of Fairfax in Marin County. The young Marine had written an letter the day before that he wouldn't be able to come home for his 22nd birthday because he "had the duty." But he caught a ride on the plane at the last minute, and had hoped to surprise his parents with his presence. The area around Niles Canyon had been witness to three major airplane crashes in a five year span: the crash of United Airlines flight #615 near Decoto in August of 1951, the crash of an Transocean Air Lines flight near Alvarado in 1953, and this mishap. "We brought him down 1,000 feet at a time," Lee Housman, an air traffic controller at Oakland, said. "Then, at 1:42 p.m., he reported he was at 3,500 feet, and we told him to begin his approach. His voice was calm, and everything appeared to be normal"
But when it crashed, the plane was about six miles northeast of the established approach lanes, Housman told the investigators. But, he said, the pilot said in his last conversation with the tower that he was on the Newark beam on course. The subsequent board of inquiry by the Marine Corps into the cause of the crash faulted the flight crew’s deviation from the prescribed holding pattern, departure from the radio beacon, and making their descent in a unprescribed manner.